The LNSD line light series is a very compact light that provides very uniform or bright light. It is available in two models, the high luminance type (which is a lot brighter) and the high uniformity type (LNSD-HU), which provides much more uniform illumination. 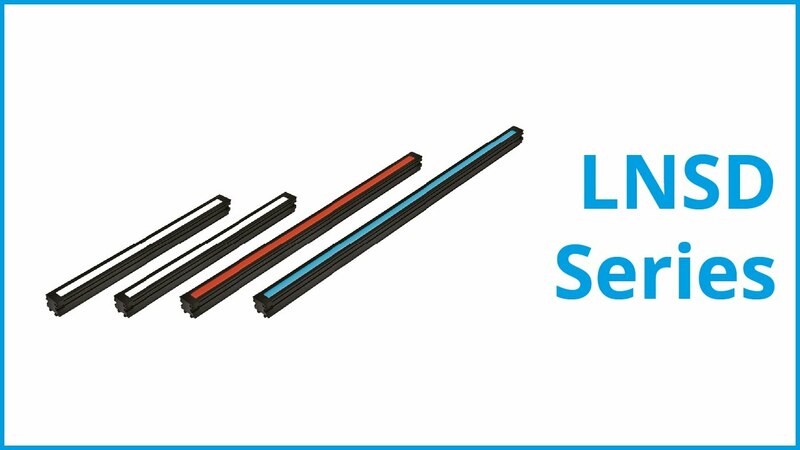 The series is available in white, red and blue in lengths from 100 mm up to 3000 mm. Thanks to its highly uniform light and compact design, the LNSD can easily replace fluorescent lights. Using LED lights instead of fluorescent lights means significant cost savings since LED lights have a far longer lifetime and therefore replacement is only very rarely needed. The high uniformity of the CCS LNSD also makes it an ideal match for use with line scan cameras. The light uniformity across the entire width of the illumination facilitates and speeds up the setup of your application so you can start your application faster. The special design with optimised housing for heat dissipation and heat resistant cables allows operating temperatures of up to 50° C. This means that in high temperature applications, no additional effort for heat protection needs to be taken to secure full functionality of the product.